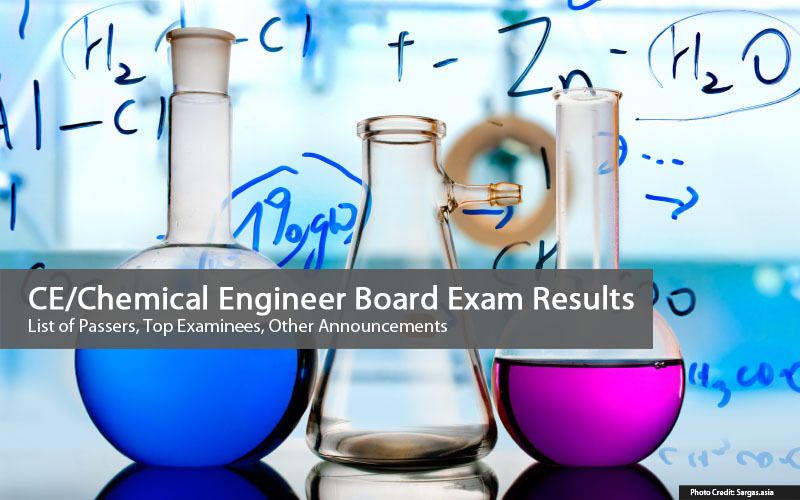 PRC released the results of the May 2016 Chemical Engineer Board Exam. As announced, 320 out of 499 passed the exams. Below is the complete list of passers. 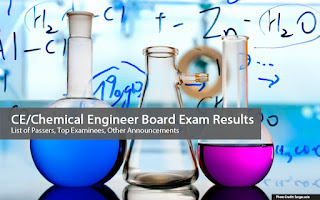 The Chemical Engineer board examination was administered by the Board of Chemical Engineering at different testing centers specifically in Manila and Cebu on May 18-20, 2016. Chemical Engineering is one of the less-numbered programs being managed the Professional Regulation Commission. The examination was given by the board composed by its Chairman, Engr. Ofelia V. Bulaong, Chairman and its members, Engr. Francisco A. Arellano and Engr. Jeffrey G. Mijares. Registration requirements: duly accomplished Oath Form, latest/current CTC or cedula, 1 piece of colored passport ID picture with white background and nametag, 2 sets of doc stamps and 1 short envelope with name and profession written 3. Registration Fee of 600 pesos and Annual Registration Fee of 450 pesos for the year 2016-2019. PRC also reminds initial registrants to come on scheduled time to avoid inconvenience on registration. Details of which are written here. On November 2015, 466 out of 874 passed. University of the Philippines Diliman ranked first as the top performing school for having 77 out of 82 examinees or 93.90% overall passing rate. Official results were released online after 2 working days. Sed Anderson Khe Holaysan from De La Salle University Manila topped the exams for having 85.90% rating. On May 2015, 239 out of 405 passed the licensure examination. The results were released after one working day. De La Salle University Manila topped the schools for having 28 out of its 33 examinees passed or 84.85% overall passing rate. Meanwhile, Remington Bacalocos Salaya from Cerntral Philippine University topped the exams for having 83.30%. According to the Commission’s Resolution No. 2015-948 series of 2015 entitled “Schedule of Licensure Examination for Year 2016”, the target release date for the results of May 2016 ChE board exam will be on May 24, 2016 (Tuesday). As we are committed to the examinees, this web page is constantly updating its content to bring out up-to-date results about the aforesaid board examination. Examination takers can also refer to PRC official website and to our social media pages via Facebook and Twitter for a more quick view of related news and announcements.